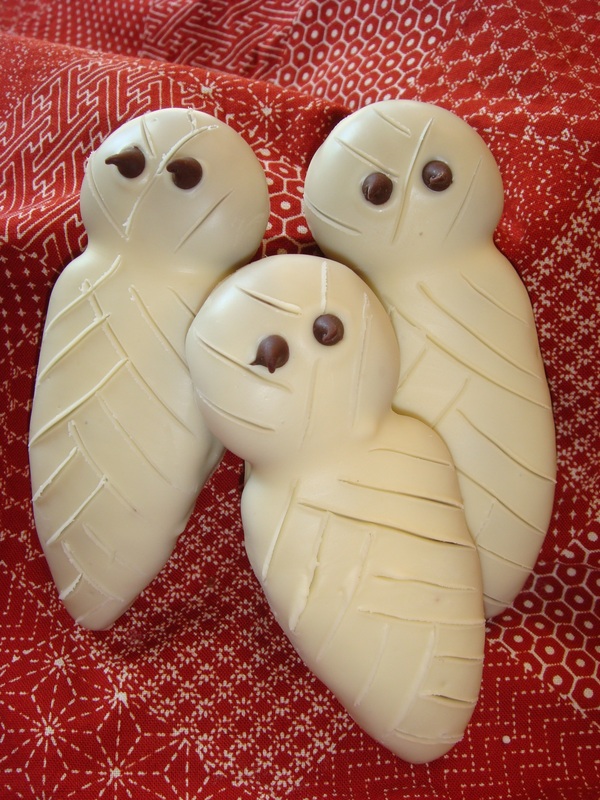 A quick recipe-reprint from last year: our favorite Yummy Mummy Cookies. The cookie is a basic chocolate sugar cookie or regular sugar cookie dough. 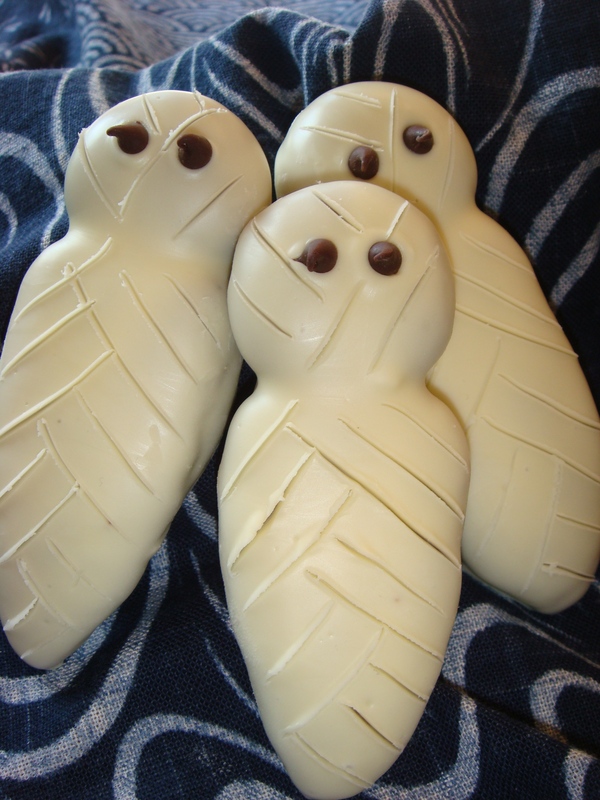 Coated in melted white chocolate and scored to look like a mummy. Visit last year’s post Yummy Mummy Cookies for details on prep. Beat butter, sugar and vanilla until creamy. Beat in eggs. Stir together dry ingredients; gradually add to butter mixture. Beat until blended. Refrigerate 20 minutes for easier handling, if desired. To form mummy bodies: Roll dough into 2-3” long carrot shape. Roll a small ball for a head. Press together on ungreased cookie sheet. Bake 8-9 minutes. Cool completely. 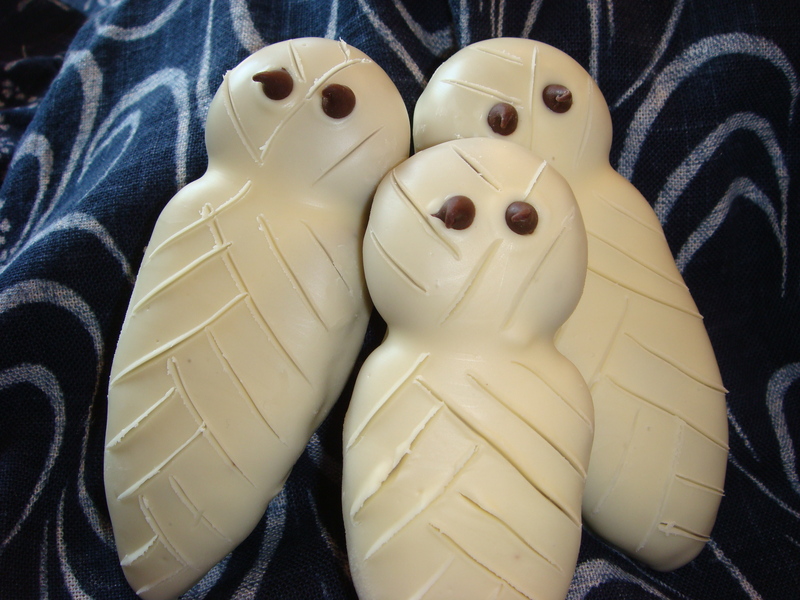 Microwave white chocolate chips and shortening until smooth. Coat tops of mummy cookies by placing one cookie at a time on a table knife. Hold knife over the bowl of melted white chocolate and spoon mixture over cookie. Gently tap knife to remove excess chocolate. Place on waxed paper. Place 2 mini chocolate chips on for eyes. As coating begins to set on cookies, use a toothpick to score lines into the coating to resemble mummy wrappings. Let harden completely before storing. FOR VANILLA MUMMY COOKIES: Use your favorite Sugar Cookie dough (one without too much spread). OMGoodness, how cute are they????? I definitely think you should try out the bats that you mentioned in your blog last year! i agree… yummy dark chocolate is better than white! very creative!! i am going to make it!! Hello! I came across your blog and I loved how theses cookies looked so cute! But I have one question…… would you know approximately how many calories are in a one cookie serving? I’m trying to make these cookies for my school’s newspaper group, and my teacher requested a almost healthy cookie. I would need to have these cookies by this Wednesday so the sooner you are able to reply, the better! Thank you!!!! Keep posting!!! Thank you for the website! I’m probably still going to make the cookies. Healthy, schmealthy!!!!!! SUCCESS!!! I made the cookies and everybody loved them!